Christian Horner feels Red Bull made progress at the Chinese GP but they are still playing catch up to Mercedes and Ferrari. Max Verstappen moved up from fifth to fourth in Sunday's race, splitting the two Ferraris of Sebastian Vettel and Charles Leclerc and enjoying a wheel-to-wheel battle with the former after the first pit stops. After a difficult Bahrain GP, Red Bull were far more competitive in Shanghai - Verstappen feeling he could have started third if not caught out in qualifying - and Horner says there are upgrades to come which he hopes will close up the gap to the cars ahead. "The chassis has made a big step forwards," Horner told Sky Sports F1. "Honda have made progress on the straights. We still have that bit to find to the cars ahead but there is stuff in the pipeline that should help us in the near future." Verstappen pitted before both Ferraris on Lap 17 and was able to undercut Leclerc as the Monegasque was kept out long. Horner added: "Good strategy managed to nick a place ahead of Ferrari. They were probably a bit quicker in the race but I think strategy got us that position. "Max has driven the wheels off the car all afternoon and good to nick fastest lap off Sebastian right at the end with Pierre." 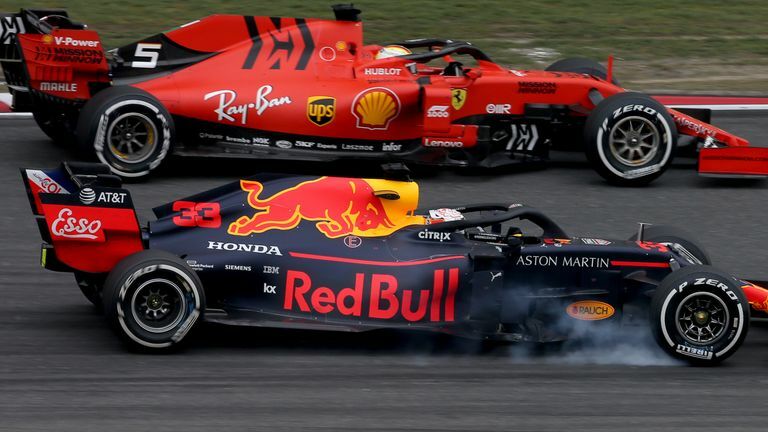 Verstappen had one chance to pass Vettel on lap 19 but he locked up attempting the overtake at the hairpin, where the pair collided 12 months ago, and the German was able to retain the place. The 21-year-old felt Red Bull had once again maximised their pace to get fourth and expects the competitiveness of the leading teams to keep changing each weekend. "I think there was not much in it. I was pushing very hard to try and stay with them," Verstappen told Sky F1. "As a team we did a good job today to undercut a Ferrari and stay ahead as well. We maximised the result to be honest. "Every weekend is a bit of a guess what you are doing and how competitive you are as well. I had a good battle with Seb but even after that we just didn't have the pace really to fight. "At least I tried, it was fun but then I settled for fourth."